The Best Color Splash & Fun Run On Earth For Kids! The only "fun run" with oh-so-many obstacles, color stations, music zones, foam, fun (& more)! We’re the HD Color Splash & Fun Run where our mission is to bring kids together and make the HD a happier, healthier place. We’re creating an experience that’s more about the fun and memories than your mile per minute or distance to the finish line. 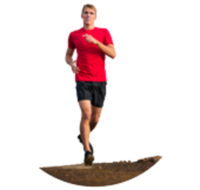 We are looking to be the largest running series in the High Desert, and a leader in the fun run catergory. Less about your 10-minute-mile and more about having the time of your life, The HD Color Splash & Fun Run is a five-kilometer timed event in which [up to] thousands of participants, or “Fun Runners”, are doused from head to toe in different colors at each kilometer or color station. 1. Wear your HD Color Splash & Fun Run shirt at the starting line! 2. Finish blasted in color! After Fun Runners complete the race, the fun continues with an unforgettable Finish Festival. 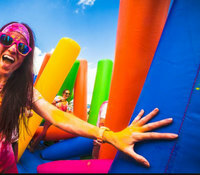 This larger than life party is equipped with music, dancing, vendor booths, food and massive color throws, which create millions of vivid color combinations. Trust us, this is the best post-5K party on the planet! *Please bring a photo ID to pick up your packet. We encourage people to attend packet pickup so we can minimize lines and wait times on event day. Yes, we do allow people to pick up packets for other people (team member, family, friends). As long as their waiver has been signed online (generally done during registration or downloaded above) you will just need to present their confirmation email. That way, we know you have permission to get your friends’ stuff! Wear your complimentary shirt or comfortable top on race day. Wearing customized team shirts is welcomed too! The most important rule: HAVE A BLAST! After you finish the course, you’ll be covered in color powder, bubbles, water color and ready to party! All items that have been pre-ordered MUST be picked up by start time on event day or at packet pickup. Unfortunately, we do not have the ability to mail items to you after event day any items that have not been claimed will be forfeited and donated. Please make time to go pick up your pre-ordered Gear or packet accordingly. Pick up your pre-ordered Gear or packet at the packet pickup location or the event. If you are unable to pick up your packet and/or registration on the pickup date, you will be able to do so on event day starting at the time listed above. There is a $10.00 fee(cash) for parking. Please arrive early to ensure you are not stuck in traffic.